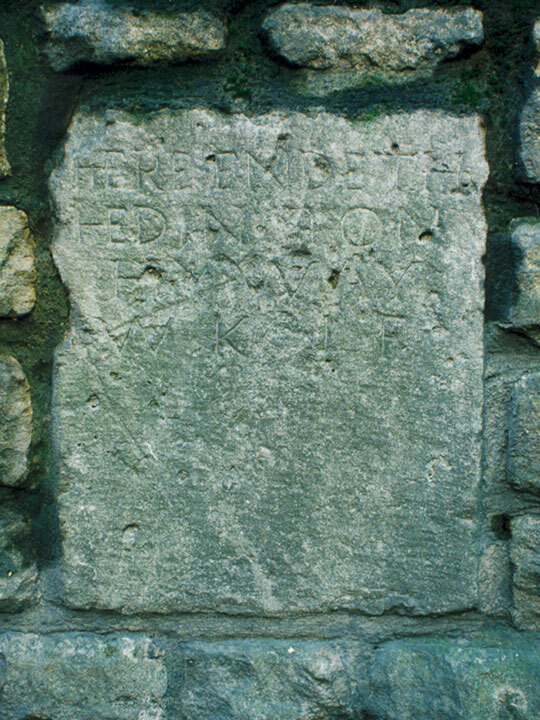 This stone is in the north wall of Headington Hill, 20 yards above the bridge. It is at the side of a main road with no pavement, so it is not safe to visit it, and today it can only be seen by cyclists travelling up the hill. It probably dates from 1729, as WK and JF are the initials of William Kenton and Jeremiah Franklin, who were respectively Senior Bailiff and Mayor of Oxford for 1728/9. When this stone was set up, this road stopped at the top of Headington Hill: the main route from Oxford to London turned off half-way up the hill to Cheney Lane and Old Road, while those wanting to go to Old Headington would ascend the road to the top and then take a route roughly along the line of Cuckoo Lane to the left. The stone is set into the retaining wall of the raised footpath up Headington Hill that had been created in about 1700. It probably stood on the road originally (although it may have been moved when the road was realigned in 1771), and it was set into this wall during road improvements in 1930. The meaning of this stone is unclear. At first sight it appears to be a boundary stone, set up by Headington to mark the end of the parish (rather like this boundary stone at the bottom of Cuckoo Lane). But if that is the case, it is strange that it bears the initials of the Mayor and Senior Bailiff of Oxford, especially as the boundary near this point was not even with Oxford (which then only stretched as far as Magdalen Bridge to the east), but with St Clement's (which extended up to near the top of Headington Hill and was not taken into the city until 1835). It seems more likely, therefore, that this is a mileway stone, set up by Oxford marking the point a mile from the city where the road ceased to be the responsibility of the city, thus having the same purpose as the mileway stone of 1667 in Warneford Lane.